I know it’s not quite November yet, but it’s time for ScrapMuch? Team A’s first of the month reveal. In keeping with our routine, the first sketch of the month is a 2 pager. I had so much fun playing with this week’s sketch! 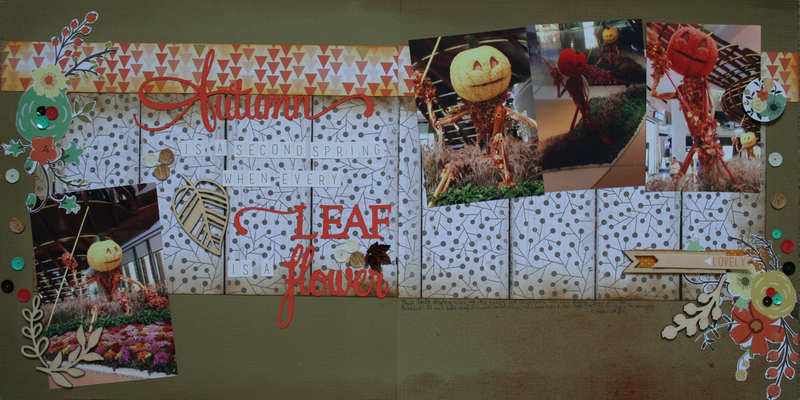 Honestly, when I took Scrapbook 101 at my LSS in 2005, the layout we created was a 2 pager. So I’ve never really found 2 page layouts all that difficult to work with. For me, the biggest challenge was finding the “perfect” fall themed paper without being too cutesy to showcase these awesome pumpkin dudes! I bought the Teresa Collins Nine and Co. collection (paper and wood embellishments) from ScrapMuch? because it really was the perfect palette for these fall colours. It is an elegant line, so it also met my criteria of being not too cutesy. That’s not to say I don’t enjoy cutesy, it just felt like most fall lines this year were on the cute side. I opted to leave the wood pieces “naked” because I wanted to keep their rustic feel. The flowers that bracket the layout are indeed fussy cut from one of the papers in the pack. The title is half cut on the Silhouette, and the other half stickers from the collection pack as I’m trying to be better about using those. The quote for the title is a beautiful Albert Camus quote, which I thought was fitting given this fall display was all done up in flowers. As for those awesome pumpkin dudes and mum displays, they were in the middle of The Shops at Crystals, which was essentially attached to my hotel on the strip in Vegas (yes yes, I still need to get that trip report up). Not only were they beautiful to look at, but they were very fragrant and aromatic too. So now it’s your turn! 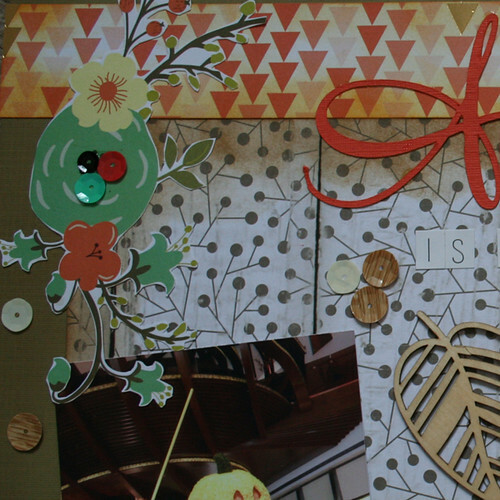 I’d love for you to pop over to the ScrapMuch? blog and see what the rest of the team created this week, including a warm welcome to our newest member from the design call, Barbara. If you haven’t tackled a 2 page layout yet, maybe this is the one you start off with. I promise, it’s not as scary or overwhelming as you may think! Remember if you play along with any of our sketch challenges or colour challenge (or maybe even combine the two and enter both!) and link up with us, you have a chance to win an awesome ScrapMuch? prize! I can’t wait to see what you create! Happy Hallowe’en! Have a great weekend and thanks for visiting! 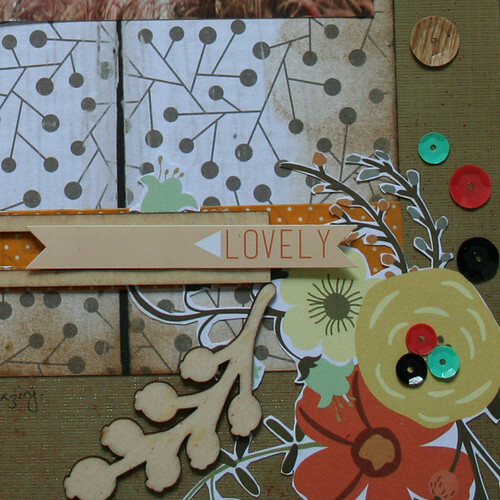 Wonderful layout Tiiu….your papers are just perfect and I love your embellishing! Yeah I know what you mean about choosing the right patterned paper for certain reason/photos. I see that you have chosen the AWESOME and PERFECT patterned papers for your photos! They are beautiful and go well with everything (your photos, your embellishments etc!) You rocked on this one! Great take on the sketch! Way to go! This page is the BOMB, I just love the colours and how you created your title! Oh and are they wood grained sequins… Swoon! Beautiful page Tiiu, perfect papers and awesome fussy cutting.